Artists from both organizations were invited to submit their applications for the project, but only six artists from each organization were selected. For PAQA-South, Ann Flaherty and Kris Carmichael, Director of the Page-Walker Arts & History Center in Cary, NC, took over the responsibility of choosing the artists. PAQA-South was represented by Mary Beth Bellah, Denny Webster, Eileen Williams, Ann Flaherty, Christine Zoller and myself. Contributing TAQS-members were Lin Hsin-Chen, Wang Li-Chun, Lin Mei-Hui, Chuang Huei-Lan, Huang Ming-Mei and Chen Yen-Chiu. ARTQUILTSrivers was first exhibited at the National Tainan Living Art Center, Tainan City, Taiwan (Republic of China), opening on August 11, 2012. From there, the art quilts traveled to the Taichung County Cultural Center, Taichung, Taiwan. Fluid Sculptors I was my contribution for this exhibition. Unfortunately, some of the instructions for the artists got – literally – lost in translation. Therefore, I created “Fluid Sculptors II” for the exhibition in the USA. 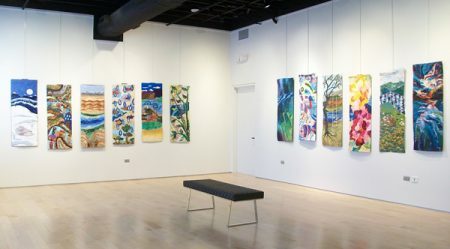 ARTQUILTSrivers was exhibited at the Page-Walker Arts & History Center in Cary, NC, and subsequently at the Gray Gallery at East Carolina University in Greenville, NC.